Is your project about more than cabinets? Do you need help envisioning how your finished project will look? Behnke Woodworking offers residential and commercial solutions from custom furniture to basic cabinetry. Our goal is to give you the unique design you’ll be proud to display in your home and office for years to come. With computer aided design (CAD), we can show you how your project will look on each wall or as a whole room in a 3D environment. It’s very liberating for our clients to be able to virtually “walk through their project” to be in one accord. We can easily incorporate your ideas and make adjustments to accomplish the design you want for your space. We are here to help you from the start to the finished product, if needed. Additionally, we can serve as the general contractor on your project, if needed. This includes design, build and installation. We are often asked if we install the cabinets we build. We do, and we are committed to this step as part of your project’s satisfactory completion. Do you have a space challenge or a challenging space? Our custom-built cabinetry offers you choices that will help you achieve an attractive addition to your home or office while making the most efficient use of the space available. 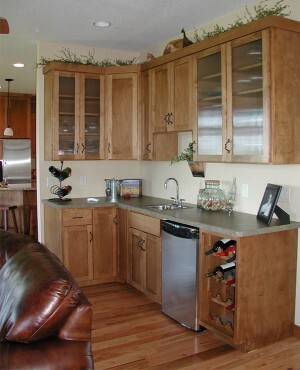 Ask us about cabinet accessories to enhance the efficiency of your kitchen or office. 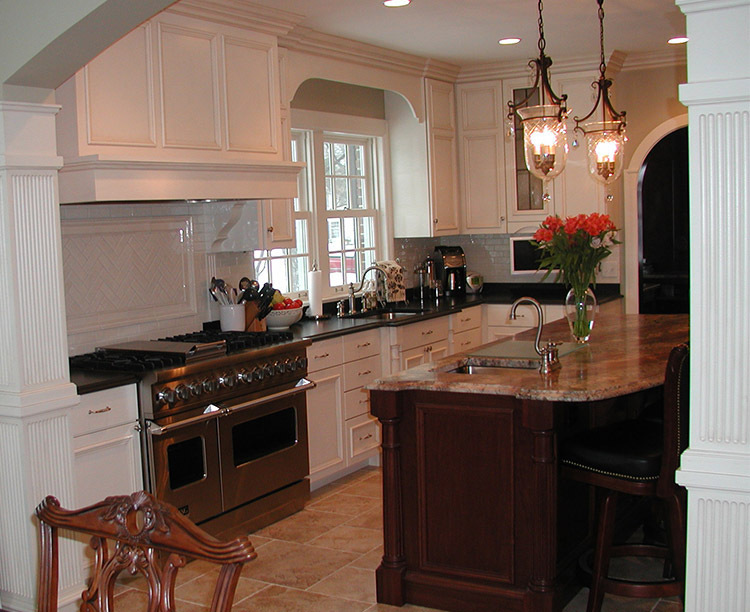 We offer overlay frame, full access, and inset cabinetry depending on our client’s taste and lifestyle. Built with ¾” thick materials of your choice. Standard is prefinished maple plywood unless specified different. These are accomplished by drilling 5MM holes with the use of metal pins. Dovetail joints out of 5/8” thick soft maple front, back, and sides. The bottom is out of ¼” maple plywood captured in a dado. Blum Tandem under-mount full extension with the Blumotion anti-slam feature is standard. Blum is the industry leader in drawer slides and hinges with a lifetime warranty. Blum 107 degree self-closing or Blum 110 degree Blumotion anti-slam. We offer a number of brands and styles to choose from or you can bring your own! Our standard wood species are alder, birch, cherry, hickory, maple, mahogany, oak, paint grade, pine, and walnut in a select and better grade. Knotty grade is also available in certain species. We offer 55 standard stain colors to choose from. If a color is desired outside from that we offer, custom color matching is available for an additional fee. We use a lacquer/ conversion varnish hybrid. It is more durable than a standard lacquer and has a longer shelf life than a conversion varnish to exceed the standard of today’s finishes. The standard brand of color we use is Benjamin Moore. The product we use is conversion varnish tinted primer for two coats along with a clear topcoat to protect against scratches and to give a deep lustrous finish. If Benjamin Moore isn’t your choice, we can match any paint color available with a brand and color code provided or we can match from a sample swatch.